WASHINGTON? Massive cost overruns on NASA's James Webb Space Telescope willimperilfunding for the agency's on-orbit astronomy missions while potentiallywipingout big-ticket space observatories and a host of less-expensivedevelopmentprojects deemed high priorities by the science community, according toexperts. Duringa Nov. 10 news conference, NASA released the findings of an independentreviewthat found the JamesWebb Space Telescope (JWST) will cost some $1.5 billionmore than itscurrent $5 billion life-cycle cost estimate, and that the observatory'slaunch,previously slated for June 2014, will not occur before September 2015. Ledby John Casani of NASA's Jet Propulsion Laboratory in Pasadena, Calif.,theIndependent Comprehensive Review Panel attributed JWST cost growth topoormanagement and inadequate funding reserves needed to develop, launchandoperate the next-generation flagship astronomy mission. AlanStern, a former associate administrator for NASA's Science MissionDirectorate,said the cost growth could ravage the agency's $1.1 billion annualastrophysicsbudget, 40 percent of which is already consumed by JWST development. "Arewe going to turn off all the many existingastrophysics satellites and kill the support to analyzethe data from themand stop building anything else, just so JWST can continue to overrun? "Stern said. "That's the question that the astrophysics community has toask of itself, and that NASA should be asking." Accordingto the independentreview panel, Congress will need to add about$250 million to NASA's$444 million request for the JWST in 2011 alone just to maintain thenewlyprojected 2015 launch date. Another $250 million will be needed in2012, inaddition to the agency's current projection of $380 million for theprogram inthat year. "Evenat the best case, the $1.5 billion upper will virtually wipe out theinspirations of the newly released decadal survey in astrophysics for2010-2020," said Stern, who currently is associate vice president oftheSouthwest Research Institute's Space Science and Engineering DivisioninBoulder, Colo.
Sternwas referring to the National Research Council report, released Aug.13, thatlaid out the science community's top priorities in astrophysicsresearch for the nextdecade.Formally titled "New Worlds, New Horizons inAstronomy and Astrophysics," the survey designated the $1.6 billionWide-Field Infrared Survey Telescope as the top priority for largemissions andalso recommended that NASA continue to spend about $100 million peryear onmore modestly priced missions. 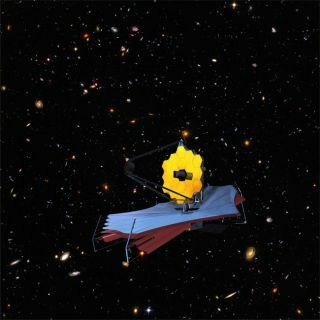 StanfordUniversity professor Roger Blandford, who chaired the decadal surveypanel,said the new cost and schedule estimates for the JWST could bedevastating tocurrent and future programs. "Clearlyit's going to have a severe impact on the current program, let alonetherecommended one," Blandford said in a Nov. 11 interview, adding thathiscommittee worked hard to develop an affordable and exciting program initssurvey. Blandfordsaid scientists participating in the decadal survey were told to assumeNASA'sastrophysics budget would remain flat or decline slightly in the decadeahead.The panel also took into consideration the strain that additional JWSTdelayswould impose on the astrophysics budget, he said. "Weput a lot of effort into those cost estimates," he said. "Obviouslyit's extremely disappointing to many people to learn that thesemanagementproblems have led to severe cost overruns and delays." NASAAdministrator Charles Bolden took responsibility for the mismanagementthat ledto the cost overruns but said NASA needs time to implement changes toprogramoversight before it can determine whether more money or time will beneeded. "I'veput a change in the management structure in place, and we've got totake sometime to see if that works, and I'm confident it will," Bolden toldreporters Nov. 12. "So I don't talk about funds or schedule, and I seenoreason to change any of those before we look at what impact the changeinmanagement has had." NorthropGrumman Aerospace Systems of Redondo Beach, Calif., is primecontractor. AnAriane 5 rocket provided by the European Space Agency is slated tolaunch theobservatory to the second Lagrange point ? a gravitationally stablespot 1.5million kilometers from Earth. NASAhas spent about $3 billion to date on the JWST program, which wasconceived in1996 as the successor to the agency's flagship Hubble Space Telescope.By thetime Northrop Grumman was awarded the prime contract to build theobservatoryin 2002, the estimated program cost was $2 billion. With14 space telescopes on orbit and several more in development, NASA'sbudget forstarting astrophysics missions was already stretched before the newJWST costestimates were released. Accordingto the independent review panel's report, it will cost $1.9 billionover thenext five or so years to finish building and launch the observatory, orabout$1.4 billion more than previously anticipated. NASA has budgeted about$600million to operate the JWST over the following five years. U.S.Sen. Barbara Mikulski (D-Md. ), who called for the independent review inJune toidentify the root causes of cost growth and schedule delays on theJWST,expressed dismay over the panel's findings and warned NASA that itcannot letthe telescope's scientific potential override the need to rein incosts. "Wecannot afford to continue with business as usual in this stark fiscalsituation," she wrote in a Nov. 10 letter to Bolden after reading theOct.29 report. AlthoughCasani's review took issue with budget and management of the program,itcharacterized the JWST's technical progress as "commendable and oftenexcellent." Thepanel recommends restructuring the JWST project office at Goddard toemphasizecost and schedule ceilings. "The flawed practice by the Project of notadequately accounting for threats in the budgeting process needsimmediatecorrection," the report states. However,the report also found that "the JWST Project has invested funds wiselyinadvancing the necessary technologies and reducing technical risk suchthat thefunds invested to date have not been wasted. The management approach,however,needs to change to focus on overall life cycle cost and a well-definedlaunchdate." Bolden,in a Nov. 10 statement, said he agrees with the panel's findings. "Noone is more concerned about the situation we find ourselves in than Iam, andthat is why I am reorganizing the JWST Project at Headquarters and theGoddardSpace Flight Center, and assigning a new senior manager at Headquartersto leadthis important effort," Bolden said. TheNASA chief said he is encouraged by the panel's finding that the JWSTistechnically sound and continues to meet its milestones. "However,I am disappointed we have not maintained the level of cost control westrive toachieve ? something the American taxpayer deserves in all of ourprojects,"he said. "NASA is committed to finding a sustainable path forward fortheprogram based on realistic cost and schedule assessments." NorthropGrumman spokesman Lon Rains said the JWST is an outstanding example ofNASA'snational and international leadership, and will yield unprecedentedadvances inour understanding of the universe. He said the company is pleased thatthe independentreview panel found JWST to be technically sound and that its design andintegrity were not questioned. "Wewill continue to work closely with NASA and our partners to deliverthisimportant science mission at the lowest possible cost, and earliestschedule,"Rains said. Thisarticle was provided by SpaceNews,dedicated tocovering all aspects of the space industry.